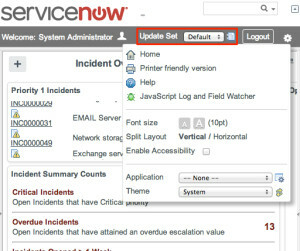 The #ServiceNow Eureka release contains many new features and changes. Among these are some significant changes to the look and feel that are generally a very nice (and needed) improvement over previous versions of ServiceNow. I have heard a few complaints about the way that the Banner Frame has been reorganized though. Instead of having the update set, language, and application pickers, etc. available directly, they’ve been moved into a separate menu which is now accessed by clicking a gear icon in the header. 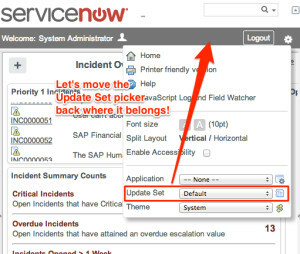 While I understand ServiceNow’s reasoning for this – the old header bar was starting to look very dated and cluttered – the update set picker in particular is something that I believe really needs to be visible to admins and developers at all times. In this post I’ll show you a quick workaround you can apply to your system to bring the update set picker back where it belongs! There’s no way to get at the back-end code that controls the gear menu popup so our only option is to manipulate the UI using client scripting. Since this is a global issue independent of any specific table or form, we can use a UI script to target the Update Set picker element and move it to a different location on the page. The following script does just that, just make sure to remember to check the ‘Global’ checkbox on the UI script record. Enjoy!